As a major supplier to one of the largest diversified health care companies in the world, SureComfort unites quality, service and value to be an exceptional product in supporting people with diabetes. 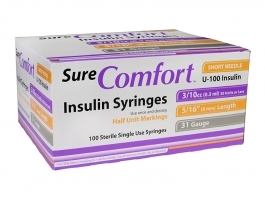 With SureComfort, you receive an ultra-sharp, burr-free, easy-to-read insulin delivery system at an excellent value. SureComfort, a National Brand Equivalent, has passed numerous tests and a comprehensive audit of our manufacturing facility by a top diabetic medical supplier. As a result, we ensure that SureComfort Insulin Syringe customers will consistently receive the same high-quality syringe. FDA registered and inspected on a regular basis.